Lock in a great price for Grand Hotel Tritone – rated 8.8 by recent guests! A hotel for the ages. Breathtaking views, awesome beach and truly dedicated people work at this facility. Would come back again in the future. This property is absolutely beautiful. 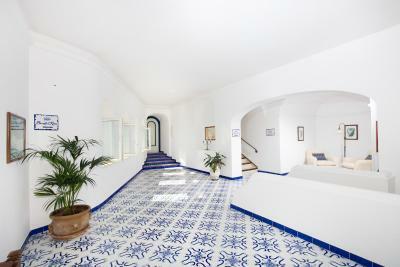 We were impressed from our first steps into the main lobby, into our room, and all the way down to the pool and beach! The elevator down to the ground level is very cool and then you proceed through a cave and end up at a great lunch restaurant, pool, and beach without leaving the property. The food was great, the staff was very accommodating. We loved Tritone and I have a feeling we'll be back! The view from our room was breath taking. You have to pinch yourself. Tritone is a very special property - because it is built on a cliff it is very unique with several elevators to get to the room and levels to explore. The private beach is OK but the uncrowded chairs and pool with ocean access right next to an outdoor bar and eatery was incredible. The elevator to the beach is really great and easy to access. The staff was so friendly, and we loved the vibe of the hotel decor. The decor is not “luxury” by any means but it is comfortable and similar to a shabby chic. I regret moving from this hotel to stay in the crowded positano for a night without beach access and a ton of stairs and next time would have made this a home base off the tourist grid to have a great time relaxing, and take a water taxi into positano or Capri!! We will def be back!! The staff is just 5 star, very helpful, the cleaner is superb! Italian hospitality at its best. help you with booking the taxi, recommending their favorute restaurants, the best route to hike the path of gods even ironing our clothes to fetching us a nail clipper. Lovely attentive staff, wonderful environment, super view. We needed everything to be perfect and it was! The food was adequate. The menu needs to be improved. 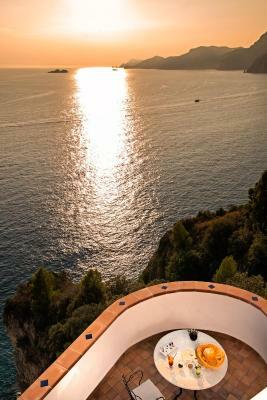 Amazing, sprawling hotel built into the side of a cliff. Lots of places to explore and hang out. Unique for the area in that it has a private beach. Overall excellent experience. Location was great, staff very nice. Went out of their way to make our honeymoon special, giving us free upgrade and allowing us to stay in room until almost 14:00. 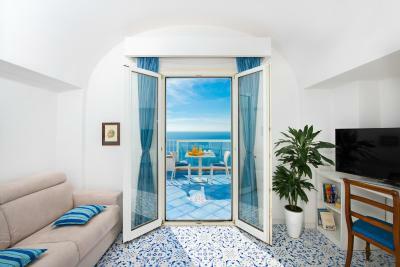 Facilities very nice- probably the best private beach in Praiano or Positano. Can't recommend enough. A wonderful, wonderful hotel with a most gracious staff. Grand Hotel Tritone This rating is a reflection of how the property compares to the industry standard when it comes to price, facilities and services available. It's based on a self-evaluation by the property. Use this rating to help choose your stay! One of our top picks in Praiano.On a cliff overlooking the Amalfi Coast, Grand Hotel Tritone offers an outdoor pool set in gardens. The private beach is directly below, and there is free Wi-Fi and free parking with valet service. Rooms at the family-run Tritone are air conditioned and equipped with satellite TV. 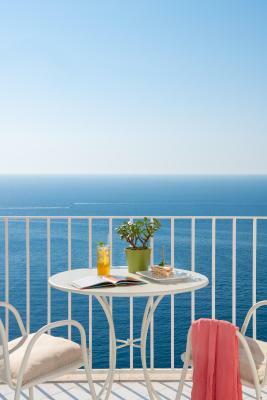 Some rooms have a seating area and a furnished balcony overlooking the sea. Restaurant La Cala delle Lampare serves traditional Mediterranean dishes out on the panoramic terrace. Beach Restaurant Ninò, found on the private beach, is open daily. The on-site wine cellar provides a wide variety of local and Italian wines. Guests can take the elevator down to the private beach below the hotel. Here you will find a bar and café serving lunch. Just a few steps from the Grand Tritone Hotel, there are busses to Praiano and Positano, both less than 10 minutes’ drive away. When would you like to stay at Grand Hotel Tritone? This large room features air conditioning and a private bathroom. It overlooks the sea. 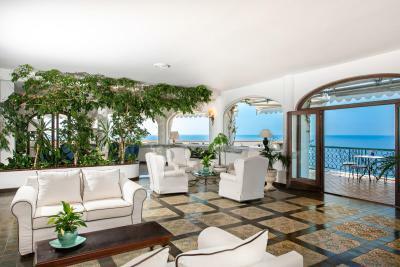 This large room features a balcony with panoramic views of the sea. The room features a terrace with panoramic view. 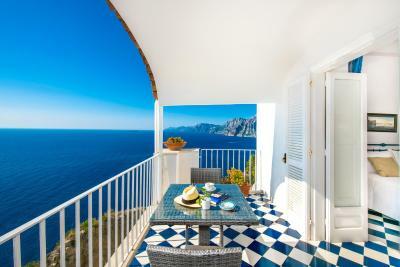 Offering a furnished balcony and sea views, this air-conditioned suite has a satellite TV and a mini-bar. The private bathroom comes with a shower. Free toiletries and bathrobes are included. Offering a furnished balcony and sea views, this air-conditioned suite has a separate living area, satellite TV and mini-bar. The private comes with a shower, free toiletries and bathrobes. Offering sea views and a furnished balcony, this air-conditioned room has a satellite TV, mini-bar and safe. The private bathroom comes with a shower, free toiletries and slippers. Featuring a furnished balcony and sea views, this air-conditioned room has satellite TV, mini-bar and safe. The private bathroom comes with a shower, free toiletries and slippers. Offering a furnished terrace and sea views, this junior suite has air conditioning, a satellite TV and mini-bar. The private bathroom comes with a shower, free toiletries and slippers. Featuring a furnished terrace and sea views, this junior suite has air conditioning, a satellite TV and mini-bar. The private bathroom comes with a shower, free toiletries and bathrobes. 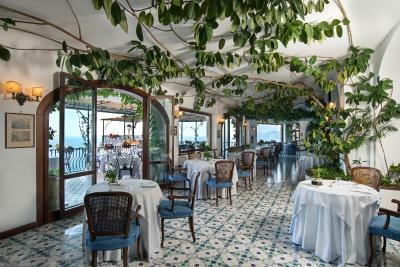 Since 1957 the Gagliano family welcomes its guests to the Grand Hotel Tritone in Praiano. An authentic place of the soul, where everything is left to be remembered: a nature rich in scents and shifting colors; the ability to be authentic, which is the distinctive trait of the owners, all masters of true hospitality. 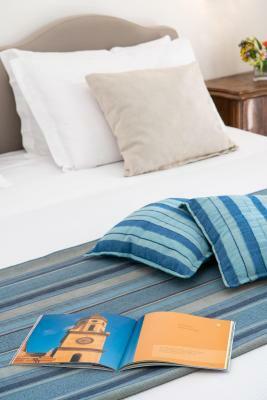 Furthermore, situated in the heart of the Amalfi coast, just in front of Capri and Positano, the Grand Hotel Tritone has the merit to be placed in a central position between many big touristic attraction, all reachable in a fast and comfortable way. 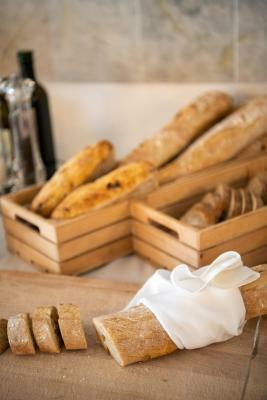 House Rules Grand Hotel Tritone takes special requests – add in the next step! ATM card Grand Hotel Tritone accepts these cards and reserves the right to temporarily hold an amount prior to arrival. Grand Hotel Tritone accepts these cards and reserves the right to temporarily hold an amount prior to arrival. Please note that pets are not allowed in the swimming pool area or in the restaurant. Views were amazing and 5mins by water boat to Positano.. The room was quite spacious and large balcony.. The staff were ok.. I'm not really sure how I would define this "hotel" because it's much more, it's more like a retreat, a sanctuary, a home. 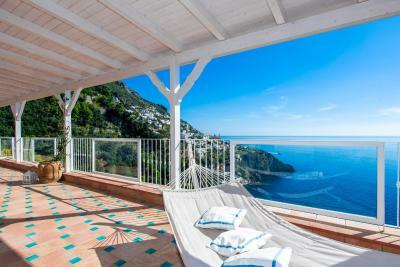 Obviously the location is perfect, artfully perched on the side of the cliff with postcard views of the sea, Positano and Praiano, but I think it's the staff that makes this place so special. Top to bottom, you are made to feel special. 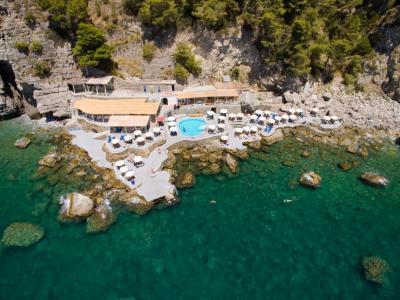 The lower beach area is a resort in itself, we could have ventured down there everyday to lay in the sun, swim in the sea and dine at Nino Beach Restaurant. You have full dining services where you can eat local specialties at lunch while drinking ice cold Prosecco, fantastic. The lobby bar is a wonderful spot to enjoy a drink and conversation with a spectacular view and the barmen are charming and accommodating. I can go into detail about the buffet breakfast, but suffice to say it's a fantastic assortment of breakfast tastes. We ate two dinners at La Cala Delle Lampare which was fantastic--the wait staff is friendly, helpful and attentive. We enjoyed a 5 star dinner looking out over the picturesque view of Praiano at night; this is a once in a lifetime kind of experience to enjoy. Could be more creative/flexible concerning dietary requirements at the restaurants and beach bar. 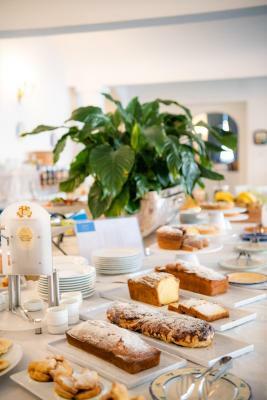 The restaurant at the hotel is rather expensive for the quality of the food, it is much better to go eat in either Positano or Praiano. The views of the restaurant at the hotel are amazing. Breakfast (not part of the restaurant) is excellent. Location was amazing, the hotel and the area is fantastic. The vallet parking is convenient and well organized, the hotel offers a water taxi to Positano which was also excellent and convenient. We loved our stay at the Grand Hotel Tritone. Yes the rooms are dated (but I think every hotel on the Almalfi is) but they are large and clean with amazing views. Location is perfect, staff very helpful in booking restaurants, taxi boats etc and the bottom area with the lounge chairs, pool, bar and private beach is the best reason for staying here. Very special place! We also loved our sunset drinks at the top bar every evening before heading into town for dinner. 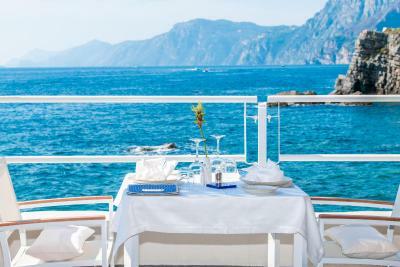 While staying there you must have lunch at Trattoria da Armandino in Praiano (hotel will organise a complementary water taxi there and back through the restaurant). Locals say it’s the best restaurant in the area and we agree. The pool was very dirty had not been cleaned, the carpet leading up to the pool was also dirty, the weather was not the best when I stayed however there were moments where the sun shone and would have loved to use the pool but got put off by seeing the state of it. Another downside is they have no self ironing facilities so if you do need anything ironed you have to send it off at €5 a piece of clothing. The staff were very friendly and welcoming, they were extremely accommodating, we had to shorten our trip and they were very flexible about it. Also the breakfast was lovely. This hotel is not a four star hotel, it’s three star with million dollar views. Let’s start with the breakfast, which is included, it was stale, tired and uninviting. In additional, the roof terrace was not open, so we could not take our breakfast outside and enjoy the view. The breakfast staff won’t bring you coffee, you have to get it from a tired coffee machine at the buffet table. 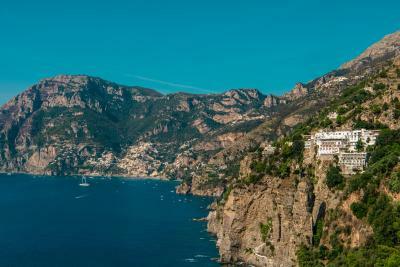 The hotel is located between Positano and Praiano and it’s inconvenient and unsafe to walk to either location, so you need to take a water taxi, taxi or bus. There is no hotel shuttle - which I think would be a simple and easy solution for the hotel to run for its guests and is offered by many other hotels along the coast. 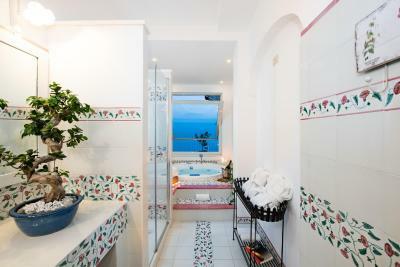 The rooms are kitsch and retro, with gorgeous floor tiles and old prints of the Amalfi Coast region - some people may also think this is dated but there is a certain charm about it. The rooms are clean, with a balcony that looks out to the water. However, they are noisy, you can hear everything guests on other balconies are saying, you are woken up late at night by guests returning to their rooms down the corridor and the sound of suitcases rolling across the tiles as people check out. There is no free drinking water in the room. The smoke from other guests cigars and cigarettes wafts through the corridors and rooms, like a sea breeze. The bathrooms are terribly dated. As we checked out, the bank card we wanted to pay with was not accepted by the hotel’s bank and no one helped us with our bags, reinforcing our overall disappointment. Some staff were helpful but the level of service did not meet our expectations of our hotel with such grandeur, history and price tag. Unfortunately, we felt that it was not worth the money and we could have spent our money better somewhere else. I really wanted to like this hotel, as it has so much potential - but I couldn’t. 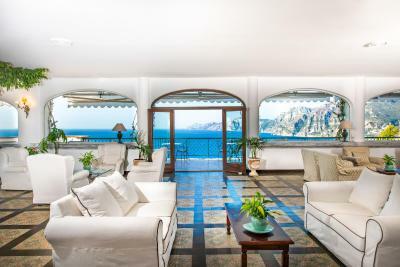 The Grand Hotel Tritone has magical views of Praiano and Positano from the rooms, shared sitting areas and the various balconies and great access to the water via its beach club at the bottom of the 500 + steps. 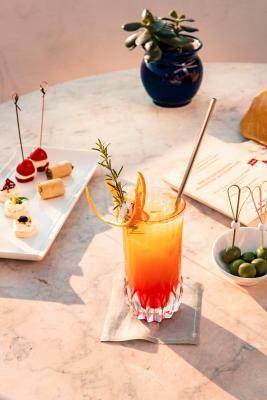 You can get a drink at the lobby bar and watch the sunset over Positano. Parking and use of the pool and beach club are included. Unfortunately these are the only positives about this hotel.